Introducing the 2019 Jeep Compass, now at Southern Greenbrier Chrysler-Jeep in Chesapeake! This compact SUV is not only versatile and stylish, but it's also capable and technologically savvy, too! Stop by your preferred Jeep Chesapeake dealer today to test-drive and experience everything the 2019 Jeep Compass has to offer today.Southern Greenbrier Chrysler-Jeep in Chesapeake proudly serves drivers from Suffolk, Hampton, Virginia Beach and the surrounding areas! The Power To Tow Up To 2,000 Lbs.! Despite its compact size, the 2018 Jeep Compass can tow up to 2,000 lbs. !It's all thanks to its standard 2.4-liter Tigershark® MultiAir® 2 engine coupled with a 9-speed automatic transmission that can deliver up to 180 horsepower and up to 175 lb.-ft. of torque! Now, you'll never have to leave your toys behind on your next adventure.You can haul along your motorcycles, smaller boats, snowmobiles and more! Compact Or Commanding - Why Not Both? 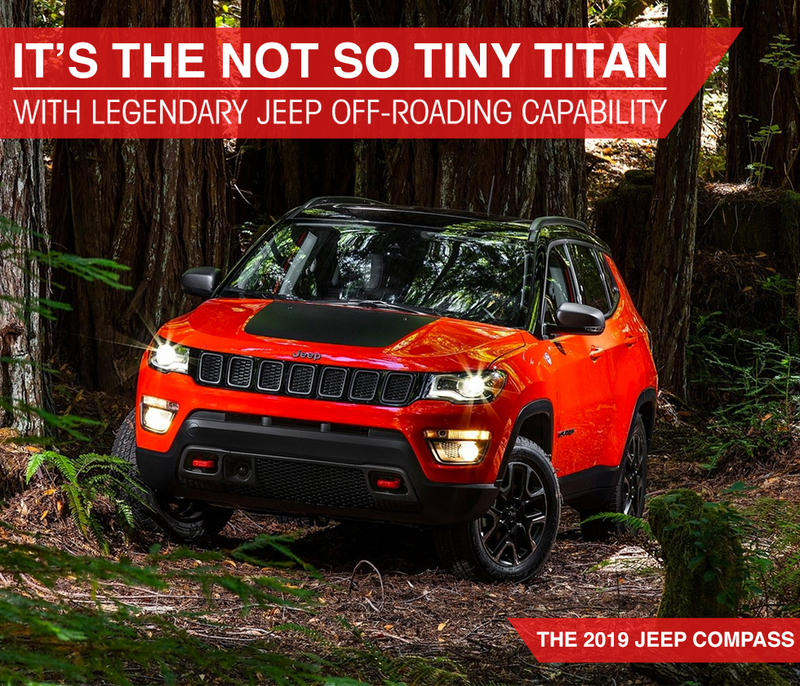 Featuring Best-in-Class 4x4 capability, the 2019 Compass Trailhawk is equipped to command even the most treacherous terrain. In fact, this compact off-roader is so capable it can forge in up to 19 inches of water, and easily climb and maneuver on snow, sand, mud and rock − all while delivering a quiet and comfortable ride inside. Going on an adventure? Take safety along without thinking twice about it in the new 2019 Jeep Compass! That's because every Jeep Compass model is designed with your complete safety in mind whether you're on the smooth road or crossing the roughest terrains. The 2019 Jeep Compass is even made with a high-strength steel frame that is designed to work with Jeep's sophisticated airbag system for all passengers in case of a collision. When you choose to buy your 2019 Jeep Compass from Chrysler-Jeep in Chesapeake, you'll get more than an amazing experience and a great price!You'll also get the Southern Hospitality Buyers Program for even more savings! This exclusive list of benefits is included to help you get the most out of your purchase or lease at no additional cost to you! Test-Drive Your New 2019 Jeep Compass At Southern Greenbrier Chrysler-Jeep in Chesapeake! Your adventure awaits behind the wheel of the new 2019 Jeep Compass!Get to Southern Greenbrier Chrysler Jeep in Chesapeake and test-drive your new Compass in your favorite trim today! Get started now by filling out a form, then visit us today to start saving. Our Jeep dealership has a huge selection of new 2019 Jeep models for you to choose from always at our best price.